The initiative for a new Presbyterian church in Madison came from Presbyterians who were moving into the community during the mid 1980s. North Alabama Presbytery and the General Assembly of the Presbyterian Church (U.S.A.) encouraged and supported this initiative. The first public service was held at Pentecost, 1988. The Rev. Joe Regan was the organizer-evangelist for the first eighteen months, leaving at the end of 1989. Dr. John Bush began his ministry at Grace on the Day of Pentecost, 1990. At that time, the congregation consisted of about thirty members. Services were held at Kid’s Stuff Day Care Center on Wall Triana Hwy, then were moved to a leased building on Castle Drive just off Slaughter Road behind Wilson Lumber Co.
Dr. John Bush began his ministry at Grace on the day of Pentecost, 1990. At that time the congregation consisted of about thirty members. In August Grace Church moved into rented space in a former furniture store on Hwy 72 just east of Hughes Road. 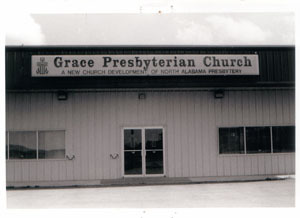 Grace Presbyterian Church (U.S.A) was founded as a congregation, with about a hundred enrolled adults and children, on March 8, 1992, at which time Dr. Bush became its first installed pastor and the congregation elected its first Session. 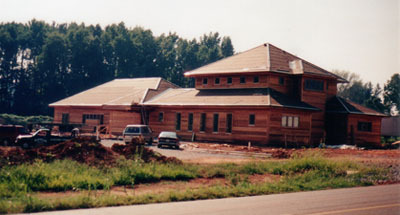 Our new church home was constructed in 1993 on a 9.75-acre site located on Wall Triana Highway in Madison. The first service was held here on the second Sunday in December. The building was dedicated "To the Glory of God" at a celebration held on Sunday, January 14, 1994. Rev. Libby Rollins became Interim Pastor after John Bush left in January 2001. Rev. Robin Palmer arrived on August 1, 2003. Robin did not come to us as a stranger, but had been a guest minister many times. She had been a chaplain at Huntsville Hospital. 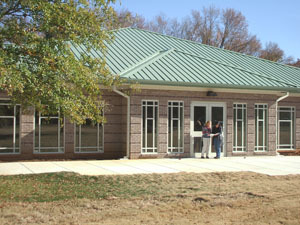 On December 14, 2008 Grace held a New Building Dedication Service for the new fellowship hall, with classrooms and library space totaling over 6300 sq.ft. This was a celebration of over three years of planning, capital campaign project, and lots of hard work.